INDEPENDENCE — Manzanar National Historic Site invites visitors to participate in a weekend of special events in conjunction with the 48th annual Manzanar Pilgrimage. All are welcome and the events are free. This year’s pilgrimage coincides with the 75th anniversary of President Franklin D. Roosevelt signing Executive Order 9066, ultimately authorizing the U.S. Army to forcibly remove and incarcerate all Japanese Americans and Japanese immigrants in California, western Oregon and Washington, and southern Arizona. The government incarcerated more than 11,000 men, women, and children in Manzanar. This year also marks the 25th anniversary of Congress’ establishment of Manzanar National Historic Site. It was the result of decades of grassroots efforts by the Manzanar Committee, beginning on a cold winter day in 1969, an event now considered the first Manzanar Pilgrimage. Pilgrimage Weekend 2017 events begin Friday, April 28, with a public reception hosted by the Friends of Eastern California Museum from 4 to 6 p.m. The Eastern California Museum is located at 155 Grant St. in Independence. It features exhibits including Shiro and Mary Nomura’s Manzanar collection, the Anna and O.K. Kelly Gallery of Native American Life, and exhibits on aspects of local and regional history. Eastern California Museum is open daily from 10 a.m. to 5 p.m. The Manzanar National Historic Site Visitor Center is open 9 a.m. to 4:30 p.m. daily. On Saturday, April 29 only, the center will extend hours to 9 a.m. to 5:30 p.m. It features extensive exhibits and an award-winning film, as well as special Junior Ranger activities for kids. A special photo exhibit, “Gambatte! Legacy of an Enduring Spirit: Reflections Then and Now” by Paul Kitagaki, Jr., will be on display through mid-May. This year, there are two additional exhibits in Barracks 8 of Block 14. “Only the Oaks Remain,” the Tuna Canyon traveling exhibit, will be at Manzanar through May. Near it, visitors can see a prototype for the new barracks classroom exhibit. Some of Manzanar’s most impressive archeological features are Japanese rock gardens. Saturday morning, Madelon Arai Yamamoto and volunteer archeologist Mary Farrell will be at the restored Arai family fish pond in Block 33 to greet visitors and share stories about the pond’s discovery and excavation. The Manzanar Pilgrimage ceremony begins at noon, Saturday, April 29, at the Manzanar Cemetery. UCLA Kyodo Taiko drummers will kick off the event at 11:30 a.m., followed by the procession of camp banners at noon. The pilgrimage program concludes with the traditional interfaith service and ondo dancing, after which park rangers will offer walking tours to those wishing to explore Manzanar. The Manzanar At Dusk program begins at 5 p.m. Saturday at Lone Pine High School located at 538 S. Main St. (Hwy. 395) in Lone Pine. The program offers participants opportunities for intergenerational discussions and sharing. The program is co-sponsored by the Nikkei Student Unions of Cal State Long Beach, Cal Poly Pomona, UCLA, and UCSD. At 11 a.m. on Sunday, April 30, Manzanar will host the U.S. Citizenship and Immigration Services for a second annual naturalization ceremony as new U.S. citizens take their oaths of allegiance. 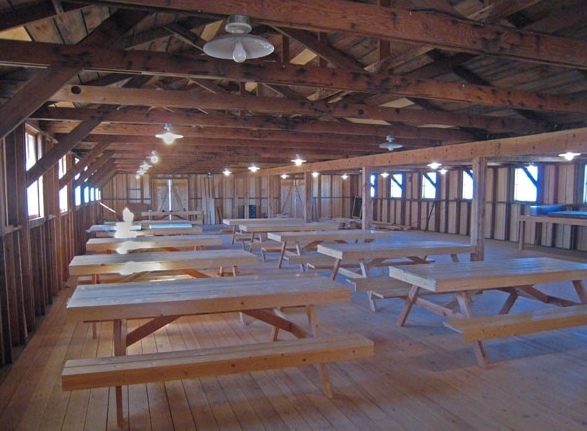 The ceremony will take place in the West Theater of the Visitor Center. Seating is limited. With the exception of Friday evening’s reception and Saturday evening’s Manzanar At Dusk program, all events take place at Manzanar National Historic Site, located at 5001 Hwy. 395, six miles south of Independence, nine miles north of Lone Pine, and approximately 230 miles northeast of Los Angeles. There is no food service at Manzanar. Bring a lunch or snacks and a water bottle. Wear sunscreen, a hat, comfortable shoes, and dress for the weather. For more information on Manzanar, call (760) 878-2194, ext. 3310 or visit www.nps.gov/manz. Additional pilgrimage program information is posted on the Manzanar Committee blog at https://blog.manzanarcommittee.org/.